Click on the bars below to all the subdivisions and condo & townhome complexes in Brighton. You can also view the most popular searches such as ranch style homes, new construction, homes with a pool or houses with mountain views. Click to see Local Subdivision and Complex Maps. What is Your Brighton Home Worth? Brighton is a municipality in the North Metro Denver region and is an important location as the county seat of Adams County. Sitting along the west of I-76, Brighton is among the best-connected cities in Colorado, providing fantastic transport links to Denver proper and to the rest of the country. That’s because Denver International Airport is just minutes away from downtown Brighton, providing one of the most important airports in the United States. As a fantastic commuter option, Brighton offers urban living that is mixed with the outdoor ruggedness that Colorado is famed for. Homeowners have been flocking to Brighton, CO for decades, and its ideal location is likely to maintain popularity into the future. Increasingly, Brighton has become a popular choice for settled families looking for a safe and affordable community to join. As a consequence, new subdivisions are consistently arriving in Brighton, evolving the city to make it one of the most sought-after in Denver Metro. Speaking of both affordable and new subdivisions, buyers will surely be interested in Brighton East Farms, Todd Creek, Brighton Crossing, and Indigo Trails. Each of these communities is an exciting new master-planned subdivision enticing new homeowners to Brighton, Colorado. While Brighton is a noted location for affordable family-oriented subdivisions, the city has its share of high-end communities, too. Indeed, upscale living in opulent luxury can be attained in the subdivisions of Todd Creek and Hayesmount Ridge Estate. Despite offering true city amenities, Brighton has not forgotten its outdoors roots and has several notable subdivisions that have specified zoning for horses. Among the equestrian-friendly communities are Box Elder, Greatrock, and Hayesmount Ridge Estates, each offering splendid homes set amongst generous 2-3 acre lots. One major reason to move to Brighton is its amazing location as a commuter town. Just minutes away from downtown Denver on the I-76 and on the frontier of Colorado’s excellent natural wonders, Brighton is a best-of-both-worlds location. It would also be remiss not to mention its proximity to Denver International Airport, which literally opens up a world of possibilities. However, there is so much more to Brighton than noting other places it connects to. Brighton, CO is loaded with things to do and amenities in its own right. Residents have access to retail, restaurants, bars, entertainment, and more from famed chains or local producers. The city also straddles the edge of Barr Lake State Park, providing residents with an outdoor escape featuring trails, picnic areas, beaches, and water sport activities. Brighton is home to the Oasis Family Aquatic Park, one of the must-see attractions during the summer months. Residents are also treated to several annual events held in Brighton, Colorado each year, such as Summerfest, Movies in the Park, Festival of Lights Parade, and the 4 th of July Celebration. 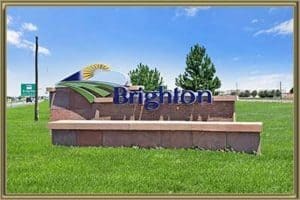 See all the Things to do in Brighton, CO.
Brighton is a vibrant real estate market where homes are consistently being listed, sold and bought. If you are looking to sell a home in Brighton, CO, the team at Gold Compass Real Estate is best placed to help you achieve your goal. Our expert agents can provide you with listing and consultation advice, while you can check out your free Brighton Home Value Instantly Online now. Gold Compass Real Estate is an expert in the Colorado housing market, including the North Metro Denver area. We have local knowledge of real estate in Brighton, making us a leader in finding potential homeowners their dream property. Through our team of experts, you will gain confidence and knowledge, including information on subdivisions in Brighton and what the city has to offer. We highly recommend the complementary Free Personalized Market Report. For more information on real estate in Brighton, Colorado, whether you are buying or selling, contact us at 303-325-5690.